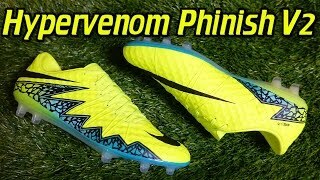 Originally the second tier boot from the Hypervenom range (before being replaced with the low cut Hypervenom Phantom 3), the Phinish is built for the agile striker. A players control is improved by the textured upper made of the NikeSkin material, giving you better feel for the ball, whilst the Flywire cables in the upper provide maximum foot lockdown. 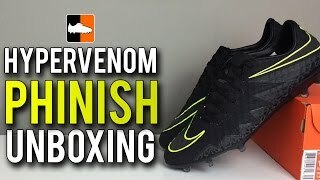 Like all top tier Hypervenom boots, Nike has designed the boot last to contour to the boots anatomical shape, ensuring the sock-like fit for comfort and agility. 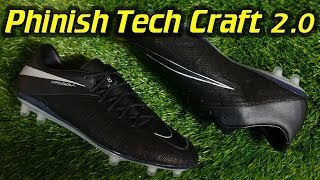 Striking the ball is more efficient as Nike have created a larger strike zone on the boot, by decreasing the lace area, ensuring the purest strike of the ball possible. 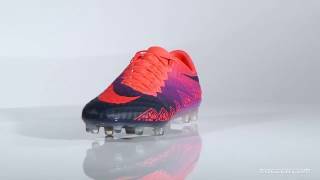 And the All Condition Control (ACC) technology allows the benefits of these boots to perform in any weather condition. 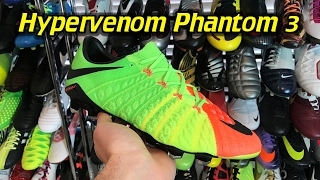 This boot is a good option for any striker looking for a low cut option, however, the technology on the Hypervenom Phantom 3 is far superior.